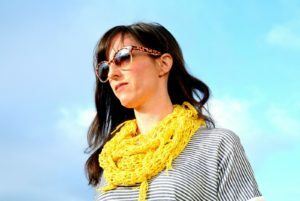 I am really enjoying my knit spring scarf (you can see it here), and I’ve had great feedback about it (thank you! ), so I wanted to make something similar with crochet. This spring scarf is perfect for beginners as it is done in single crochet only. It gets its lacy look from using a large hook with a tiny yarn. Well, it’s not that tiny, just a light yarn (size 3). This one is done in a cotton blend (I used Bernat Cotton-ish in Lemon Twill), because cotton is what I prefer in warm weather. For some reason I have the hardest time finding cotton yarns here in Colorado. I wonder if it is the same in other parts of the country? In any case, this scarf is as light weight as it gets! So get ready for summer! The picture above shows the scarf wrapped around my neck three times. I prefer this look, but also like it wrapped two times around. I added fringe along one side of the scarf, but that is optional. **This is all done in Single Crochet. You must make the single crochet into the stitch, not the hole that is created below. 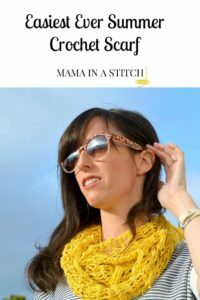 Make sure you are crocheting into the actual stitch on top of the hole. 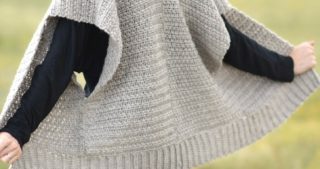 Once length is reached, join ends with a slip stitch. 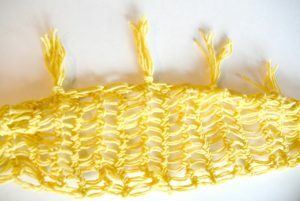 **It is helpful to count your stitches as you make this scarf. I actually added stitches to a couple of rows, and had to pull it apart. If you are a beginner, especially, make sure to count 13 across each row. Because of the big hook and little yarn, it can get tricky. Cut 6 strings approximately 5 inches long. Holding them all together, fold in half. Place folded half through a stitch on the edge of the scarf. Draw the ends of the yarn, through the folded portion, and pull tight to secure tassel. If this explanation doesn’t help you enough, check out YouTube. 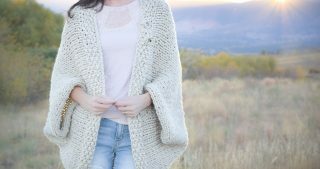 There are so many tutorials on how to add tassels onto crochet. It is super easy! It’s long, skinny, lightweight and soft! There you have it! A super easy summer scarf! Here it is wrapped around my neck twice – scarf selfie! It was nice enough for me to take my daughter to the zoo the other day. I am so ready for winter to move on! 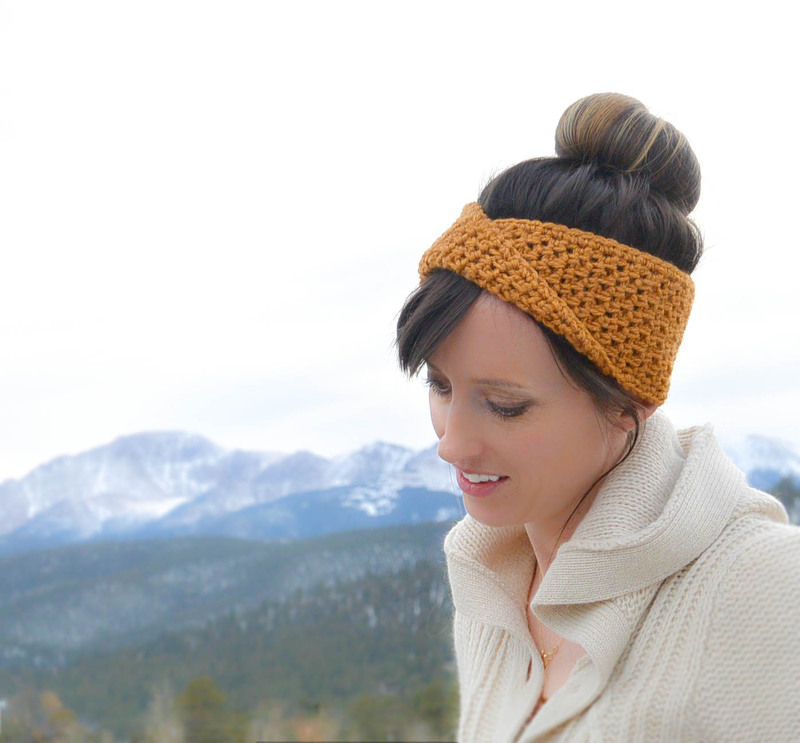 If you liked this, please check out my other easy crochet patterns! 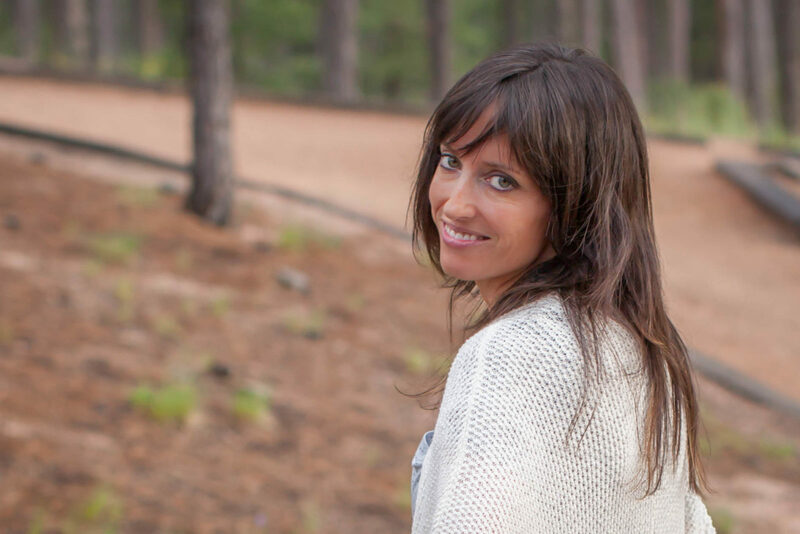 Subscribe to the blog and follow me on Facebook, Twitter and Instagram! I love hearing from you! Also, as always, let me know if you have any questions or if I can improve the pattern! Very nice and I like the color for Spring! Hi Jessica. Thanks so much for this pattern. I luv it. I have been searching some time for a light scarf pattern to make with red heart unforgettable yarn. I have started this one and it looks great. So happy you like it Mel! Feel free to post a pic on my Facebook page! Can’t wait to try it but I think I’m missing something… Row 2. I understand repeat until finish but repeat what? Can’t seem to find Row 2 instructions. Am losing it? Hi Christine – I will make this part more clear. You repeat the pattern for Row 1 in Row 2. Hope that makes sense, and I will update the pattern to better describe what to do! Thank You for being so nice. You help all of us so much. Going to start today making this one. Hi Claudia! You’re welcome, and THANK YOU for being so nice and taking the time to comment and let me know you will be starting this. I hope you like how it works up for you! Thanks for letting me know! So glad you like it. 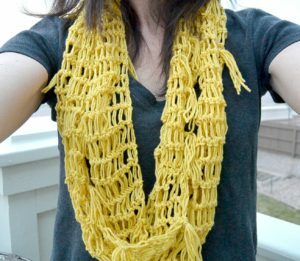 I can hardly wait to make this scarf. If mine turns out as well as yours…Mother’s Day gifts! Many thanks for a great new project! You are more than welcome, Vicki! Great idea to make it for Mother’s Day! By the way, I think this would work well with a worsted weight cotton too. The cotton I used is very light, which I like. But if someone wanted a little more weight to it, you could use te worsted weight as well. Just a thought for you as you make it. Enjoy! I love the looks of this scarf! I’m sorry to have to ask but I’m fairly new to crochet and am not understanding the pattern yet. I am visualizing all sc and not seeing how to get the string looking part… or are they elongated sc? Thanks for sharing your pattern too! Yes, it is all done in single crochet. 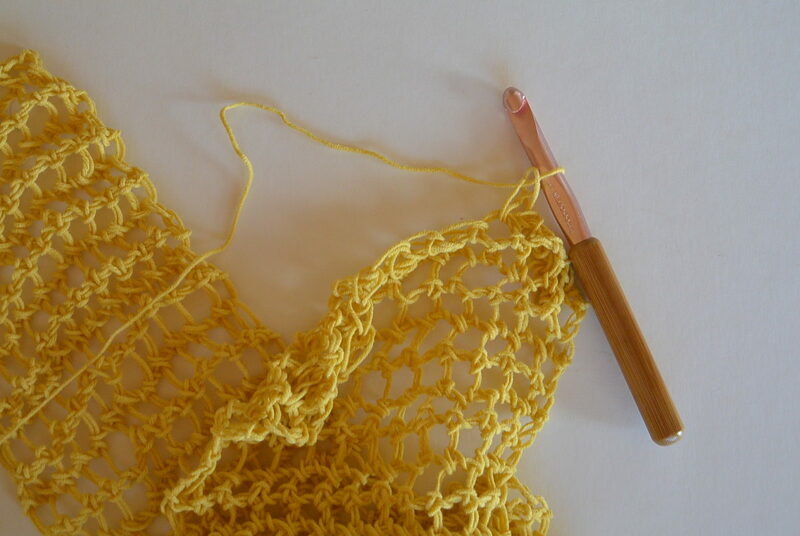 The reason it is “stringy” or lacy is because of the hook size. 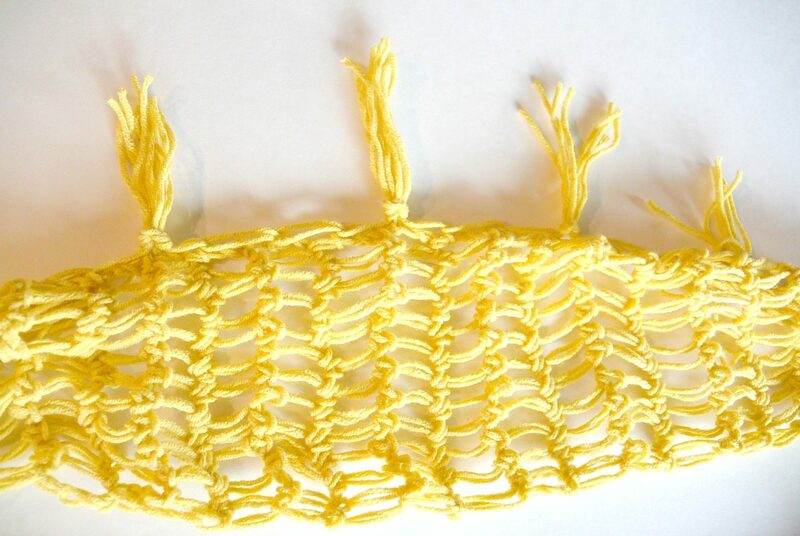 It will make it look like this without anything special to do…you just single crochet! You need to use the size N hook, otherwise it won’t work. Let me know if you have other questions! Jessica, thanks for your reply. I have now attempted this very cute pattern several times. I am using a Boye 9.00MM hook. I’ve tried it with #3 yarn as well as #4 using a Q hook. But regardless I can not achieve the stringy look that makes this so appealing. Any thoughts as to what I can do to achieve this look? Any thoughts would be greatly appreciated as I have at least 6 scarves I would like to make for Mother’s Day. Many thanks. Yay! I bought the yarn as well as a different hook. Re-followed your instructions, and it was a success! Many thanks! Thanks, I really appreciated your help. Happy week! You`re welcome! Happy week to you also! Sure do appreciate you taking the time to ‘splain that to me, Jessica, wanted to make sure I understood b4 trying it! Thanks for all the time you put into making this a nice blog. Make sure that you single crochet into the stitch, not into the hole. That is another key part to the scarf that I think some people have missed and found some trouble. Let me know if you have any issues as you make it. Thanks! You’re welcome, Floa! I hope you like it! Feel free to modify it to your tastes…I think next time, I will make it wider. Maybe start with a chain that is twice as long. The pattern could be changed in so many ways. Have a great day! Thanks for this pattern! I have been looking for something to make with my giant hook! I want this to work so well! I am new to crochet since Christmas but am ‘hooked”! I have made no less than 20 scarves with Lion Brand Homespun. It is time to move on to spring and summer scarves. i want the look you have created here!. 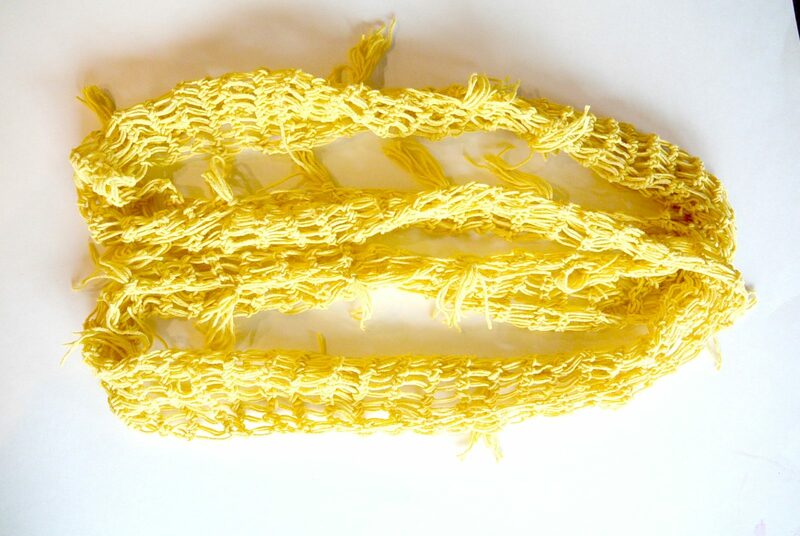 yarn shrink when washed? Should I be concerned about this? Thank you so much! Mothers day gifts sound great too! Hi Lisa! I’m right there with you being ‘hooked’! One of my first scarves was with Homespun too! You can use worsted weight cotton and get the same look 🙂 I used a size’N’ hook, 10. As far as your questions about cotton, I am definitely no expert about that-ha ha! I have used some cotton yarns that have shrunk. With other cotton yarns I just make sure to wash cold and lay flat to dry. For this scarf, I will definitely just hand wash or delicate wash on cold. Once you get started on this scarf, it won’t take long to see if you like how it’s going to look. Best of luck! I purchased the Hobby Lobby “I Love This Cotton” which is a 4, not 3, so I used a larger12 mm hook which I think is equivalent to a “P”. I still don’t think my scarf looks as open as your pictures., and I am crocheting into the stitch, not the hole. What is the width of your finished scarf? My next option is “Q” hook or maybe try a double stitch?…but don’t think it would look the same. Very pretty scarf…thanks for sharing. 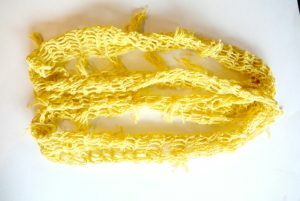 Hi Janice, This is the hard part about not being there in person to show you how my scarf turned out, and how to do it. It sounds like you are doing everything correctly. I actually just pulled out some scrap yarn of I LOVE THIS COTTON, and it worked up just fine with my N hook. The P hook that you used would give you even larger holes. The scarf itself is only about 5 inches wide (and it kind of “clings” so in parts looks even slimmer). When I wear it I kind of pull it apart a bit before I put it on. The holes are about 1/2 inch wide each, maybe you were hoping for larger? The scarf itself looks larger on my neck in the one picture because I’ve wrapped it multiple times. 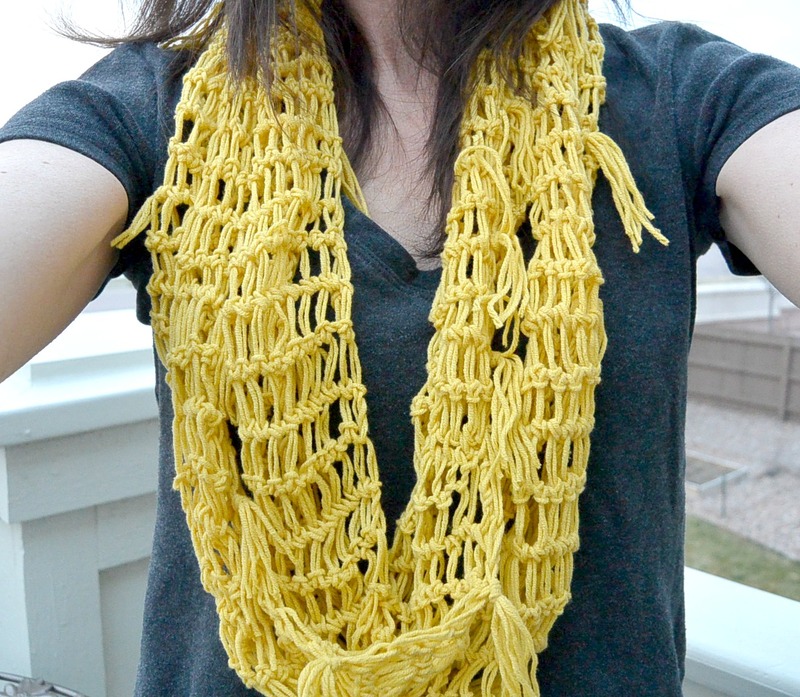 If I made it again, I would make the original chain longer to have a wider scarf – This one is long and skinny. If you have any other questions that might help, let me know! Sorry it’s been a challenge! Great, thanks so much for the info. My stitche holes are about 1/2 inch, if stretched a bit, and the width is 5 1/2”. I’m pleased with the way it looks….probably just a very tight crocheter. Thanks again. Janice…I am new to crochet, sort of a beginner +, I have more experience knitting. 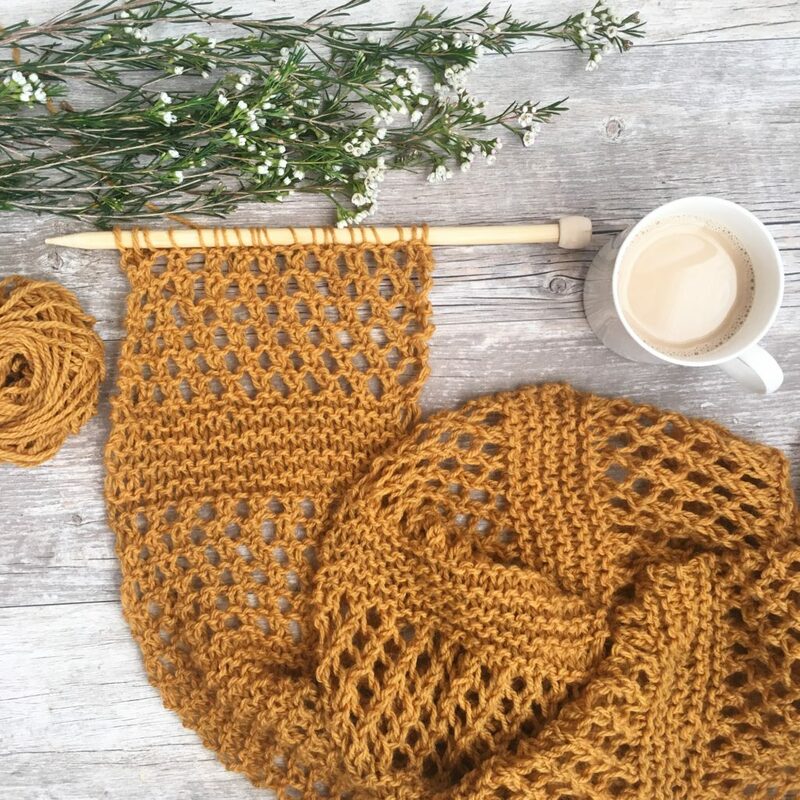 Crochet is my craft now because of arthritis and the ability to use ergonomic hooks.Your scarf is so light and summery looking, it keeps drawing me in when I see it. I live in North Florida and think this is perfect for a cooler summer day or air-conditioned restaurant. Nice work! Thanks for the comment and kind words! I have often thought about what folks in the warmer parts of the country (like Florida) like to knit and crochet. You are right, the air conditioning can get really cold sometimes in restaurants etc. Thanks for letting me know that you like this! I am hoping to make some other light scarf patterns like this during the summer here in Colorado. The scarf is lovely, I am going to try it real soon. The picture of you with the scarf wrapped around twice looks like a dropped stitch knit pattern. I’m sure this was much faster to do than that. No matter how I have stitched I cannot make the stringy look.what what does stitch into the stitch mean. Is it part of the V. I feel I have tried picking up the back thread of the V and that doesn’t look right I haven’t crocheted in a long time and this looked cute and easy. While it is still cute I am not finding it to be easy yet. Thanks for your help. Hi Pam, I’m so sorry for the frustration! Let me go through a few things to see if anything might help. I am assuming you are comfortable with how to single crochet, if not check out how to do it on YouTube. Since you’re probably already good with that, lets make sure everything else is set. Are you using a hook at least as large if not larger than what I used? Are you using worsted weight yarn, or smaller? 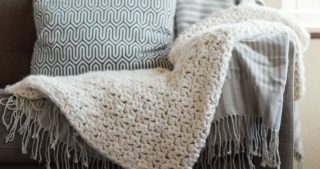 When you crochet, you need to be crocheting into the uppermost stitch. Meaning, you are making a hole because of the large needle, but don’t put your hook through the hole, just the tippy top stitch. It’s truly just single crochet like anything else. The stringy tassels are added at the end. I don’t know if that helps at all. I did have some comments that folks have had some problems figuring out how to do it so that it looks right, and usually it’s the wrong hook size. What a pretty scarf! I live in Florida so I’m always on the lookout for scarves I can wear all year. Thanks for sharing!